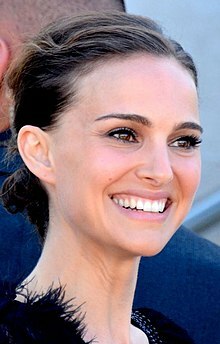 Portman was born on June 9, 1981, in Jerusalem. Her parents are both Jewish. Her parents gave her the traditional Hebrew name of "Neta-Lee". She is the only child of Shelley (née Stevens), an American homemaker who works as Portman's agent, and Avner Hershlag, an Israeli fertility specialist and gynecologist. Her maternal grandparents, Bernice (née Hurwitz) and Arthur Stevens (whose family surname was originally Edelstein), were from Jewish families who moved to the United States from Austria and Russia. Portman's paternal grandparents, Mania (née Portman) and Zvi Yehuda Hershlag, were Jewish immigrants to Israel. Zvi, born in Poland, moved to what was then Mandatory Palestine in 1938 and eventually became an economics professor. His parents died at the Auschwitz Concentration Camp. One of Portman's paternal great-grandmothers was born in Romania and was a spy for British Intelligence during World War II. ^ a b David Letterman (host) (November 24, 1997). The Late Show. CBS. Natalie Portman.